Nauru, an island nation that has formal diplomatic relations with Taiwan, hosted the Forty-Ninth Pacific Islands Forum this week. Why it matters: It's rare to see any foreign leader take such a strong stance towards Beijing and its growing diplomatic assertiveness. The South Pacific is a focus for Beijing as part of its efforts to pick off Taiwan's few remaining diplomatic allies. Importantly, it's also because the People's Liberation Army is looking for ways to extend beyond the first island chain into the broader Pacific Ocean. The details: First, the country refused to stamp the official diplomatic passports of the PRC diplomats. 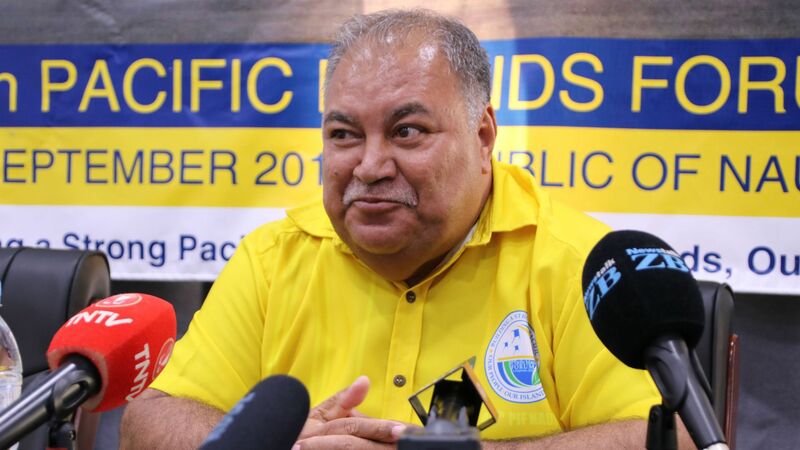 Then Nauru President Baron Waqa prevented the PRC representative from speaking out of turn at the forum, leading to the Chinese diplomat walking out, ABC News Australia reports. "His behaviour in front of our leaders, ministers and officials was uncalled for. ... He disrespected the Pacific and its leaders and our dialogue partners who had come to join us in our own meeting." "Look at him, he is a nobody. He is not even a minister and demanding to be recognised and to speak before the Prime Minister of Tuvalu. Is he crazy?" "We will not only ask for a formal apology, we will actually take it up to the United Nations. Not only that, I will mention it at the UN and every international meeting to raise our concerns about this incident." Go deeper: The Australian reported Friday that Australia "successfully blocked China from funding a major ­regional military base in Fiji, a move that reveals intensifying concern in Canberra over strategic competition in the South Pacific region."